Toyohara Kunichika (1835-1900) Magic in the Twelve Signs of the Zodiac: Monkey - Onoe Kikugoro as Mibu no Kozaru, 1877. Oban. This fine series is not so well known and the prints from it are rare to find in good condition. All the prints in the series pair one of the buddhist signs of the zodiac with an appropriate or related actor in a scene from history or kabuki. Not all of the references are to actual plays and it is possible that some of the scenes are imagined. For more information on the zodiac and its treatment in ukiyo-e see our blog post on the subject. The connection with monkey is clearly stated in this print. Pictured is kabuki actor Onoe Kikugoro, imagined as the samurai hero Mibu no Kozaru in the play Tsuki no Ume Megumi no Kagekiyo. 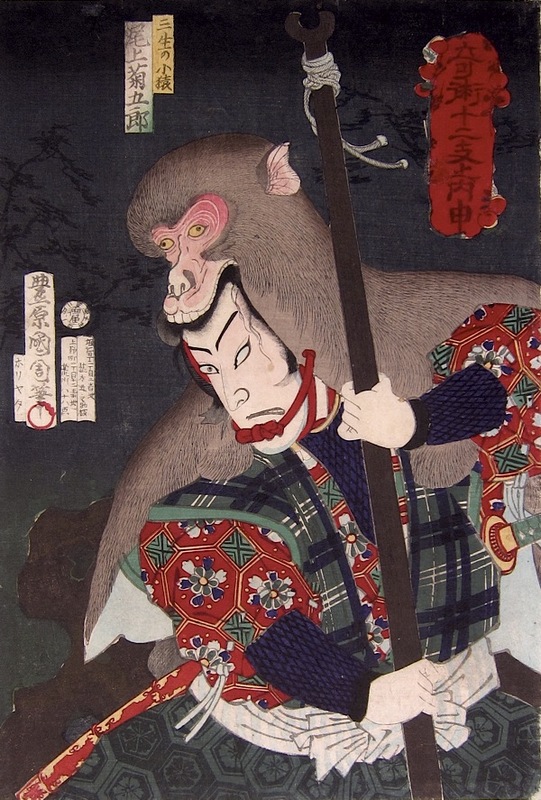 The connection is not only visual here, Kunichika has punned the Japanese word for monkey, saru, with the character’s name, Kozaru. This a very strong, powerful image - the fierce samurai with the monkey skin helmet looms out of the darkness at us. The impression, condition and colour are all superb, a fine print from this rare and important series. We have other prints from this series not in this show - please enquire if you would like more information.